I hope you all had a chance to read The End of Fashion, one of my favorite non-fiction books about the fashion industry. This book looks at the forces that transformed the industry in the late 20th century, changing it from a top-down business controlled by designers and fashion editors to the consumer-driven business we know today. You already know that I liked this book … now I want to know what you think! Was any of the information in this book surprising to you? 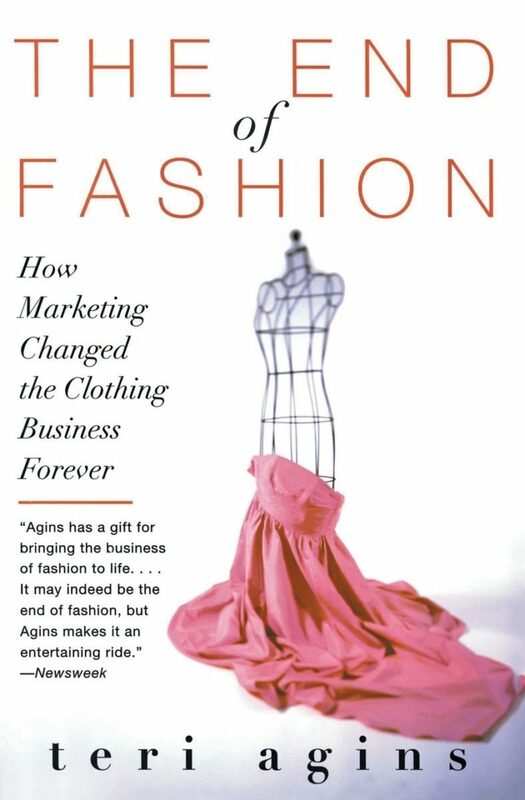 Did this book change your opinions on the fashion industry in any way? Each chapter profiles one or two designers. Which was your favorite designer profile, and why? Don’t forget to join the Colette Book Club email list! We’ll send you book announcements and reminder emails, so you never miss a discussion, or a good read! I’m not sure I would recommend The End of Fashion but I’m glad I read it. The information was interesting and thoroughly researched, but all the details… and from this person to this other person constantly seemed disorganized. However, organizing all that information, and all the back stories must have been a real PITA. I did like that the author took a straight forward view and seemed neither for or against the fashion industry. I thought I liked the chapter on Giorgio Armani best until I read about Zoran. That was a good profile to end it on. She tied in all the pitfalls the previous chapters talked about and what Zoran had done in similar situations. I always admired his clothes anyway so maybe I “got” what he was trying to do easier than the other featured designers. Plus he seemed the most down to Earth. I wish there was a second edition to find out how this story has evolved since it was first published. Good choice, thanks for picking it. Like Mary, I am glad to have read the book, but for me it was occasionally a bit of a slog. Definitely full of information! Surprises – learning about the ownership structure of different brands was quite interesting to me, and hard to learn about anywhere else. Favourite designer – Zoran! He sounds delightfully eccentric in the way that I would love for a friend to work for him so that I would hear all the stories, but I would not actually want to put up with him myself :) I love his take on clothing and fashion and keeping things simple. The book was very informative! I really enjoyed it up until all of the nitty gritty of the big conglomerates buying/ selling fashion houses etc.. that got a bit boring. Otherwise a good read. Would have liked to hear more details about how “urban” designers/ street fashion effected the end of trickle down fashion. I have admittedly read and re-read this book a few times over the years. I appreciate her approach to the subject, and while it can get dry at times, it’s still a fascinating view into the world of fashion, and how it has been corporatized. The Lauren/Hilfiger rivalry is hilarious, but they both achieved outrageous success by using tactics that many other houses wouldn’t deign to touch for a long time. Now it seems all are about the profit margins rather than the artistry. Zoran has always been my favorite designer story, primarily because I appreciate his philosophy behind the design. Having a simple, yet attractive and flattering wardrobe that will last and be relevant for years is FAR better than having a ton of clothes that will be dated rather quickly. Other quirks of his may be unorthodox, but it did sound like he had a good sense of aesthetics. Donna Karan’s story and business issues tickle me. When I was growing up and even now, the advertising really pushed the idea that her brand was “It” for ambitious working women. It’s funny to see how the business was no more than a chaotic circus of ridiculous whims and bad business sense on her part. This book and others like it have helped strip away the illusions that many fashion advertisers have built up. The marketing that the brands create are infectious, promoting the idea that one’s life can be enhanced by owning a product with their label on it. Our society also enforces this idea, considering how people will evaluate your worth based on external factors. It’s amazing how much has changed over the past few decades, or the past century. I have a soft spot for the department stores stories, considering I am a native Chicagoan. I’m just barely old enough to remember the Marshall Field’s when it still had some of the glamour that defined it in earlier days. I remember how my grandmother would dress up and treat going to Field’s as an Event, where we’d spend the day wandering around, and stopping for lunch. She never took me to the tea room, since I was too young. A few years later the whole store had changed, becoming more like the suburban strip malls, with all the discounts and promotions. It broke my heart when Field’s was lost to Macy’s. I had grown up with this idea that one day, as my career progressed, I would be one of those stylish adult women able to shop at Field’s. The Macy’s there now is unimpressive. One of my “treasures” is a vintage coat from the mid-century with a Marshall Field’s label. The construction is such that the coat looks relatively new, and is still a very relevant design. Not bad for a coat nearly twice as old as I am. Every time I’ve read this book, I always wish she would either update this one, or write another book covering the period between the end of this book, around early 2000’s, to current. So much has happened in that span of time that it would be interesting to learn more of how the industry has been impacted by the various world events and economic fluctuations. Have we read “The Lost Art of Dress” by Linda Przybyszewski, yet? I think it’s a good pairing with this subject line. She discusses how home sewing was a vital staple of how our society dressed for a long time, and how the department stores played a part in the downgrading of our wardrobes. This turned out to be a longer and more difficult read than I expected but I’m glad I stuck with it and took my time. Wading through all the names and details got tedious at times but given that I’ve mostly ignored retail fashion, I learned a lot. Coming in without a very high regard for the fashion industry, the biggest surprise was the Zoran story. How cool that he managed to strike a balance between the elitist perfectionism of haute couture and the comfortable, easy to wear clothes that have been popular since the 80s while also running a scandal-free, profitable business! I did a little research and it sounds like since he retired his brand, he does occasional designing for private clients. What’s there not to love? There are several aspects of the fashion industry that I found similar to the home sewing world. For example, cult of personality and personal brand play a huge role in both fashion and sewing pattern retail in a way that I don’t see in many other industries. Where they have Armani and Gucci, we have patterns by Gertie or MimiG and independent pattern companies named for their creators (as I assumed Colette was for some time!). And as garment sewing has become popular again, patterns themselves have been democratized with simpler, more comfortable styles coming to the forefront. I agree with Miranda that a sequel or updated edition would be fantastic. I’d be very curious to see how how Agins discusses the rise of fashion bloggers, Instagram, reality stars and other new ways that the fashion industry and its marketing have evolved. And I’d love to read your thoughts on the book, Kat! A worthwhile book and one I wouldn’t have read without a prompt from the Colette Book Group. The amount of currency undercut by losses surprised me. Billions! I loved learning about the day-to-day business challenges for the larger houses. The struggles between the designers and their finance partners were not a surprise, but now I am much smarter about what can happen to a company that goes public and why that company’s product and innovation suffers in the marketplace. Like many readers, Zoran’s very practical business sense made him my favorite designer, especially after reading the story of packing all the model’s outfits in a single, small case at the end of a showing. Brilliant! I read this book at the same time I read “Disrupted” by Dan Lyon. Lyon’s book also covers the drive to take a company public and the numbers behind that drive. At least with fashion houses there is a real product unlike many software IPO’s. One quibble from me. I never doubted Teri Agins reporting, but we part ways over the book’s title. Colette and other independent houses, are an example of the enduring appeal of fashion. Fashion has not ended. The book to me, was more about the end of the couture empire and its influence on how we dress. Thanks Shanna! I’ll have to check that out.